A Department of Accounting and General Services worker shoved a load of corrugated cardboard yesterday in front of the state's new reverse vending machines in the Diamond Head cargo bay of the state Capitol. The machines are available 8 a.m. to 5 p.m. weekdays. The building where the Bottle Bill originated is now a site where bottles and cans can be brought for recycling. 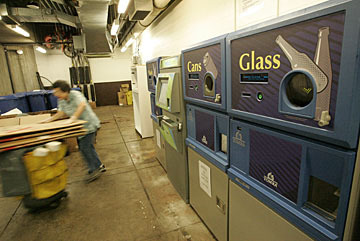 State lawmakers announced yesterday that three reverse vending machines for glass, plastic and aluminum beverage containers are now up and running in the state Capitol parking garage. Placement of the machines -- which accept containers and then provide a receipt that can be redeemed for the 5-cent deposit that was paid when purchasing a beverage -- comes about three months after the same system was set up at City Hall. "The state Capitol should be a role model for Hawaii's recycling efforts, so we are pleased that we now have a convenient place for people in the downtown area to recycle their bottles and cans," said House Energy and Environmental Protection Chairwoman Hermina Morita, who was instrumental in winning passage of the bill. Morita (D, Hanalei-Kapaa) credited House Chief Clerk Patricia Mau-Shimizu for taking the initiative to bring recycling to the Capitol and coordinating with the agencies involved. "It's important for all public buildings to be involved in recycling efforts," Mau-Shimizu said. "It's especially important for this building because this is where the recycling bill emanated from." Hawaii's Beverage Container Deposit Law went into effect Jan. 1, when 5-cent refunds were made available on qualified beverage containers. The program, aimed at encouraging recycling, has faced criticism that it is too inconvenient to recycle the containers, leading to millions of dollars in unclaimed refunds. Machines at the Capitol and at Honolulu Hale are part of a demonstration project with Reynolds Recycling, which will oversee daily maintenance and emptying of the machines. The Capitol machines are located on the loading dock in the parking area on the basement level of the building and are open to the public from 8 a.m. to 5 p.m. weekdays. There is one machine each for plastic bottles, glass bottles and aluminum cans. The vending machine issues a receipt for the bottles and cans, which users can immediately redeem for cash at an "Instadeem" coin machine that is also on the loading dock. Although there is no one stationed at the machines to assist users, things could change if traffic becomes heavy enough to warrant an overseer. "Since we're entering into the unknown, we don't know what the usage is going to be," Mau-Shimizu said. She said there were no additional security concerns, noting that the parking garage is inaccessible to the general public after business hours.